The Playful Cat Once Known As The "Foreign" Cat. Every owner will tell you that this breed's favourite place is between you and your book, or newspaper, or keyboard! These active and athletic cats are great lovers of company, they are shamless flirts. In physique and temperament they are a Siamese, but in solid colours. There is some dispute over the status of the pointed Orientals that do crop up: most fancies classify them as Siamese. Orientals can suffer from inherited heart problems, but they have impressively long lives, belying their reputation as a delicate breed. The breed is a relative newcomer, starting from the 1950's, until recently the breed was called "foreign" in Britain and "Oriental" in America. These cats are People-oriented, affectionate, devoted and very demanding of attention from their human companions, they are very energetic, playful and love to get involved in whatever you are doing. In the busiest moments, your Oriental will find a way to interrupt your activities; a little nudge while you eat, a close examination of your tooth brush prior to use, or some help tying your shoes before you leave in the morning. It’s understood you’ll need help deciding which items to select from the refrigerator! In the calmest of times they’ll share the warmth of your lap, provide a comforting purr, and nuzzle your chin when you need it the most. They have been known to open a drawer, or empty your purse to discover their favourite toy. It might be a pen or a crumpled up piece of paper that they can chase around the kitchen floor, it really doesn’t matter. Give them the attention and affection they so desperately need, and they will do anything to please you. Ignore them, and they will droop with despair. These elegant, svelte cats remain playful, spirited and loyal well beyond their youth. 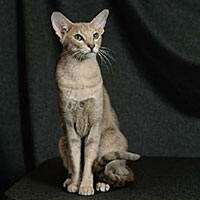 Oriental Shorthair's have an inquisitive quality that makes them very enduring and wonderful pets. Oriental Shorthair's love heat, the hotter the better. A low-maintenance pet, they shed very little and require only minimal grooming: once a week or so, you should groom them with your bare hands and trim their claws regularly. Otherwise, they never need bathing unless, thanks to their inquisitive nature, they have got into something messy. The feel of the Oriental Shorthair's fur has been likened to a silk glove covering a steel hand. If you wish to adopt an Oriental Shorthair, be advised that these cats are very affectionate, they want a lot of attention from their humans. If such a cat is for you, check out several breeders, and be sure to see the parents before adopting so you can determine their temperament. Also check the environment in which the kitten was raised. You should look for several indications of good health: normal respiration, bright eyes, clean ears and no coughing or sneezing. Eye colour is usually green. White Orientals and bi-colour Orientals may have blue, green or odd-eyed eye colour. There are over 155 varieties of colour and patterns in Oriental Shorthairs. Breed colours include; black, havana, red, blue, lilac, fawn, cream, caramel, apricot, foreign white, black tortie, chocolate tortie, cinnamon tortie, blue torite, lilac tortie, fawn tortie and caramel tortie. © 2006-2019 AnimalPets.org. Page generation 0.001 seconds. Chasing some big Online Casino bucks best usa casinos online. jokermobilecasino.com.